Free your time and focus on what’s important! The Productive Self is a free ebook on the productivity strategies and tools I use to focus on what is important. It presents simple strategies, case studies, approaches, and tools to make you more effective in your business and life. Life is too small to spend it on the things does not have importance either to your life nor to the life of the people you care about. This is the reason it is important to focus on the things does make a difference. This little book, collects simple strategies, hacks, and tools to help you move from the low productivity zone to the high effective zone of competency you can master with little effort. 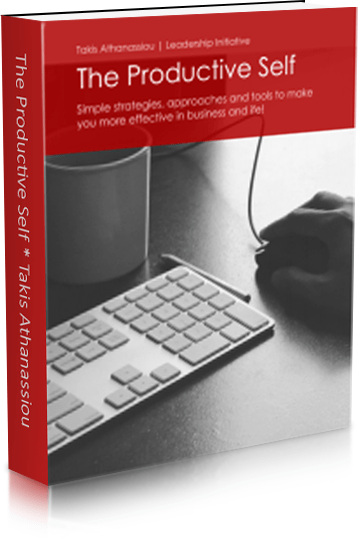 The Productive Self ebook is focused on actionable steps and practical examples can help you better your life and enhance your business productivity. The 5W+1H of Productivity. The 5W+1H productivity formula is analogous to the original 5W+1H formula, referred to the information gathering and covers disciplines as the journalism, research, investigation, etc. Using this formula, we can have a solid reference matrix for evaluating and answering (with a degree of certainty! ), questions related to the productivity. 3 Productivity Tips To Make Your Day. You are always in demand for productivity tips that make our life easier. Productivity is a much elusive and much-required feature, by anyone, wants to do better and more effectively, today. Under the present living and working conditions, time, seems, never to be enough. Here are 3 tips can make you cope with your daily tasks more effectively. How to Boost Up Your Productivity. Productivity is an essential factor in today personal and professional life. It is important for everyone wants to improve the conditions of his or her life. Furthermore, it is important for anyone wants to do more and make a difference! Productivity it is defined in different ways, by different people. But, in essence, it means to do the things you ought to do in a more efficient way. The Hidden Infrastructure For A Productive Day. Modern working conditions require modern tools to help you manage your work and focus on what’s important. I use daily a set of tools that help me to manage my work and connect me with the people I need to communicate. You can now have it for free and get a small guide full of strategies and tips to help you focus on what matters most to you. Get your free copy now, by subscribing to my newsletter (tip: you can use the form below)! Download the Productive Self e-Book here! An e-Book to help you free your time and focus on what's important!